The Lexiconary Sensory Tour is about to start! 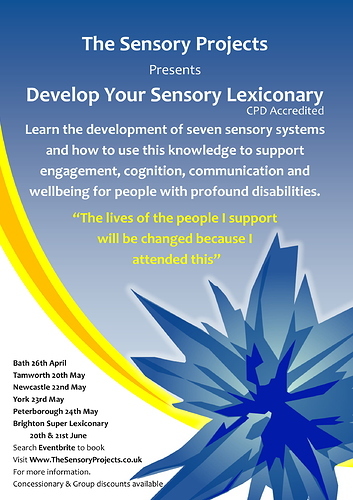 The Develop Your Sensory Lexiconary Day teaches you how seven sensory systems develop and shows you how to use this knowledge to better support engagement, communication, cognition and mental health for people with profound disabilities. It is a very energetic and lively day populated by bright eyed people keen to do their best for the people they support. There’s always a lovely lunch, endless tea and coffee and lots of bunting with extra insights and ideas. The Super Lexiconary (the two day version) has guest speakers and tackles nine senses. The Lexiconary is coming to Bath, Newcastle, Brighton, York and Tamworth. There are discount tickets for groups of 3 and concessionary tickets for family members/carers/students. I would love to welcome you to an event.